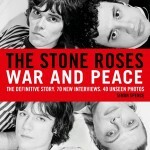 Major biography, The Stone Roses: War and Peace, is based on 400 hours of interviews with over seventy of The Stone Roses’ closest associates, including six former band members. The book captures the magic that is The Stone Roses, getting to the heart of a band that have been perpetually and intentionally hard to fathom for 30 years. It is a defining book. About a band that defined a generation. More than 100 interviews went into the making of War and Peace. Often these interviews would run, when transcribed, to over 10,000 words. In the writing and editing process, many details, insights and whole episodes from these transcripts had to be axed to keep the narrative pace of the book moving. Already I have cobbled together exerts from this excess material for three long articles. Here, however, is the opportunity to publish the basis of the book in its purest, simplest form: the full transcripts of the interviews. Where the interviews took part in two separate sessions, or lasted more than two hours, the transcript has been halved. The first part will appear here and the second part on the book’s website. This is the one. It’s the definitive biography of the band, stuffed with photos that have never been seen before. The writing feels really fresh and definitive. It’s a classic – Alex Heminsley BBC 6 Music Book of the Month . A comprehensive, no-holds-barred account… details with steely, forensic precision the story of the group’s ascent, heyday and spectacular implosion. All the triumphs and disasters are here – The Sunday Times. A forensic, detailed and beautifully researched history of the Stone Roses…. full of new stuff – John Harris. This is the one Stone Roses book fans will want to read. Copies of this superb biography will not remain on shop shelves for long – The Bookseller. An era-defining, definitive biography – Q. A loving and detailed biog – Mojo. Cute on the machinations of the industry and internal band politics – The Times, Book of the Week. Brilliant… forensically put together – Gordon Smart XFM.